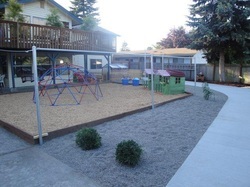 We can create beautiful play areas. Till, level, grade land. Prep and lay sod, gravel, play chips and dirt. Concrete breakouts. 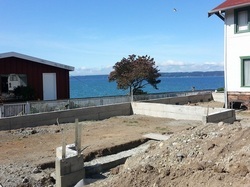 Build rock and retaining walls. And much more! We create wood fences from the basic to the intricate. 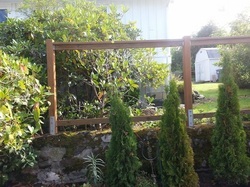 This fence was built on top of an existing rock wall with specially-made brackets from Lakewood Ironworks. EJL Construction can help you prep for your new construction through land clearing, trenching, leveling, etc. Even on the most uneven land areas, we can clear your pesky blackberries and you can avoid the goat poop! EJL Construction is ready to tackle your flipping needs. We can help you from beautifying the land to tackling the interior updates.